This Photo was taken in the mid-1970s near the corner of N.C. Highway 12 and School Road Looking toward the sand road now known as Lawton Lane. The house in this picture sat where the gravel parking lot of Spencer’s Market is now located. 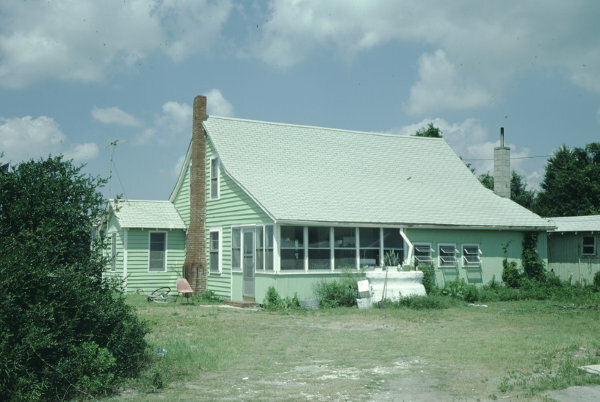 It is a rare example of the coastal cottage form of house on Ocracoke. It was built in about 1900 and was the site of a WPA (Works Progress Administration) women’s sewing room during the depression. It was moved and now serves as a local business. It can be seen in this even older photograph. Can you spot it in the village?